A Daniels Corporation rep describes aspects of some of the built form in the Regent Park redevelopment process. Photo by Daniel Rotsztain. The 2014 Complete Streets Forum took place this Monday, Oct.6, at Daniels Spectrum in Regent Park. Organized by the Toronto Centre for Active Transportation - also known as TCAT - the event provided an opportunity for professionals, researchers and advocates to share and address current issues and best practices for improving health and happiness through street design. An overarching theme that arose throughout speakers' anecdotes was the need to create a broader cycling contingent throughout Toronto. In order for pro-cycling attitudes to progress beyond squabbles over singular bike lanes mired by combative politics, the focus must be making all forms of active transportation more inclusive for everyone. First and foremost, this means creating a network of streets where pedestrians and cyclists of all abilities feel safe, including children and seniors. Toronto's grid showed glaring insufficiency when compared to pedestrian and cycling havens in several European cities. While this may not be news, it did illustrate the gravity of Toronto's situation. The first keynote speaker of the day was Dr. John Pucher, a professor at Rutgers University. Pucher highlighted some key demographic differences between Canada (along with the United States and Britain) and the bike Mecca’s of central and northern Europe. He also noted comparative gender gaps. Canada sees around 30 per cent of bike trips made by females. For Denmark, Germany, the Netherlands as well as Japan, this number is over 50 per cent, reaching 56 per cent on the high end. The proportion of female cyclists on the road can be viewed as a strong metric for successful bike policy and infrastructure, which in turn also leads to potential for increased ridership of both kids and seniors. Safety and comfort are crucial. Many European nations with more comfortable, complete streets show much higher rates of cycling for children and seniors. 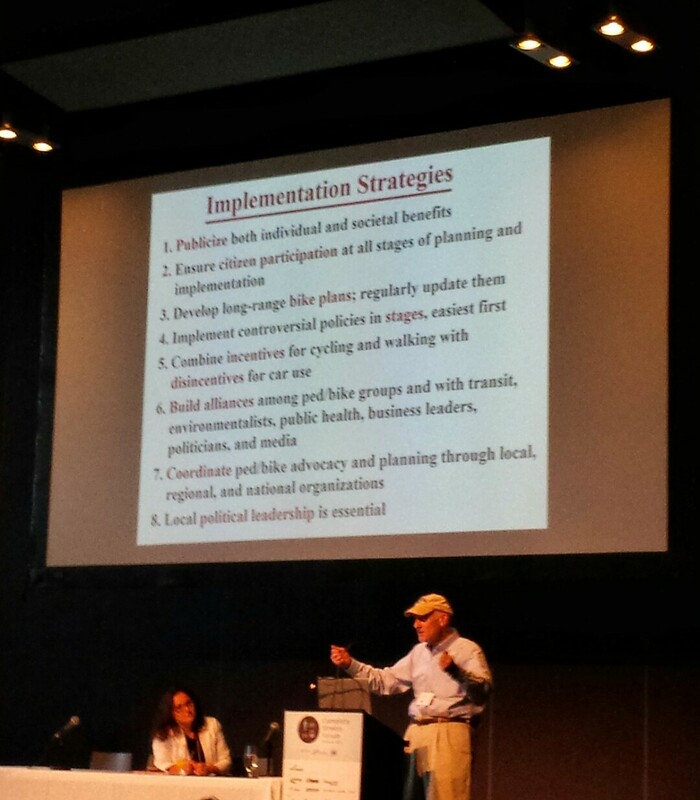 Dr. John Pucher breaks down implementation strategies in his keynote address. Photo by Corey Horowitz. When designing Complete Streets, it is essential to consider the context of user experience and who the space is intended for said Dr. Jeannette Montufor, an engineer and professor of transportation at the University of Manitoba. 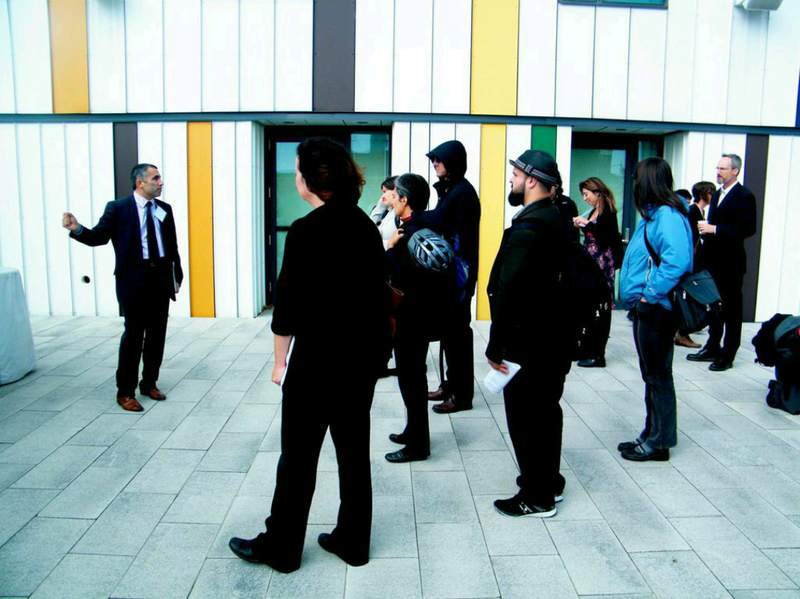 Montufor expressed how street design must redress its “one size fits all” approach. Priorities ought to be identified according to user characteristics, mode of transportation, speed and purpose. In accommodating walking, cycling, transit and automobiles, there will need to be compromise. Pucher identified the cycle tracks on Sherbourne in Toronto as a positive step, with an approximate increase of 300 users per day since completion. The City also has plans to install more contraflow lanes, bringing the total to 22 by 2015. Toronto has a long way to go to adapt its structural devotion to auto-centric culture established in the 1950’s. Unlike Germany, Denmark, the Netherlands and other parts in Europe, we did not foresee the benefit of pedestrian-friendly streets in the 70s and 80s. Now we must work to catch up. Also among the keynote speakers was medical officer of health for the City of Toronto, Dr. David McKeown, who emphasized the importance of complete streets in the link between public realm design and public health. Designing healthy streets requires attention to three key principles: accessibility, safety and experience. This entails features such as continuity in cycling infrastructure and street art. Toronto chief planner Jennifer Keesmaat moderated the final panel of the day, which discussed the process for engaging communities and stakeholders in a complete streets approach to the ongoing Eglinton Avenue corridor plan. 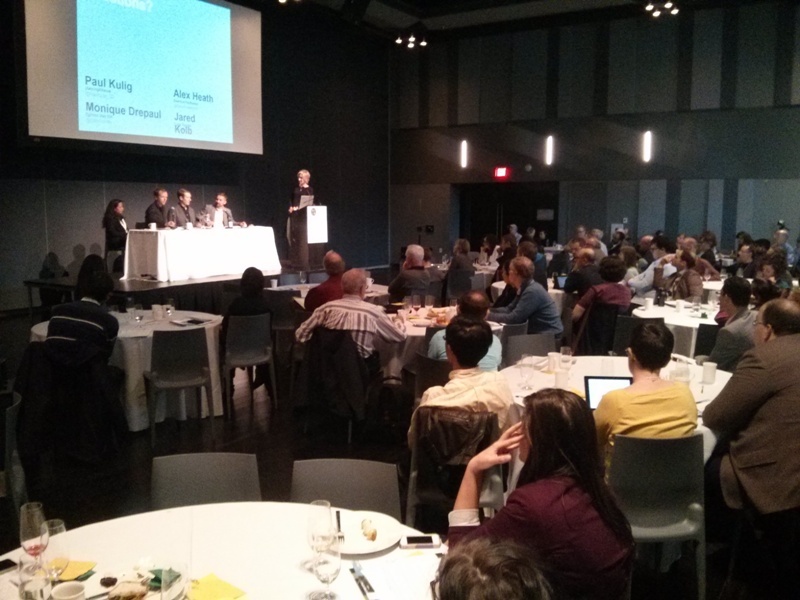 Toronto's chief planner, Jennifer Keesmaat, moderated the closing panel discussion at the seventh annual Complete Streets Forum, hosted by TCAT on Oct. 6, 2014. Photo by Matt Talsma. We all know that Toronto has a mobility problem. This problem is what brought together this dedicated group of about 230 planners, policy makers, traffic engineers, landscape architects and other concerned observers to the 7th annual Complete Streets Forum. The term "complete streets" — long familiar to urban planning scholars — is now gaining traction among the wider public because of the efforts of groups like TCAT and events like Monday's forum. The idea is that a street only qualifies as "complete" if it safely satisfies the needs of all users. Dr. Montufar provided some historical context. She explained that we are dealing with problems originally set in motion on June 29, 1956, after the signing of the American Interstate Bill initiated the development of a country-wide — and subsequently continent-wide — web of roadways. Initially pitched as high-speed, coast-to-coast "ribbons of pristine concrete," the legacy of the 20th century highway network has North America in an unanticipated predicament. Many cities are plagued by traffic and the resulting concomitant health, safety and environmental issues. As sociologist John Urry said, cars have become the literal "iron cage of modernity." It's difficult to identify the perfect complete street in Toronto, but there are a couple solid examples that stand out: St. George Street with its widened sidewalks, bike lanes and street tress, and College Street in the section with bike lanes and extended sidewalks at the intersections. Toronto can also be optimistic that a few more are in the works. Examples include the nearly finished Queen's Quay Waterfront Toronto revamp (a stretch along the waterfront previously described as "ugly and chronically dysfunctional"), as well as the still distant, yet eventually-awesome Eglinton Crosstown redesign. York region's Highway 7 redevelopment offers a lower density example that includes new bike lanes and a high-speed bus right-of-way. Montufar, a traffic engineer by training, also noted that the conventional training of traffic engineers was geared towards optimizing automobile movement, with a total lack of aesthetic consideration for other road users, but the complete street design principles are starting to become more popular in the planning profession. More immediately promising are recent advancements made among business communities. Merchants are coming around to the fact that bike lanes are good for business. Research has shown the shopkeepers have consistently over-estimated the proportion of their customers driving in. The revelation that the majority of customers are pedestrians and cyclists was instrumental in the inclusion of bike lanes in the Eglinton redevelopment. 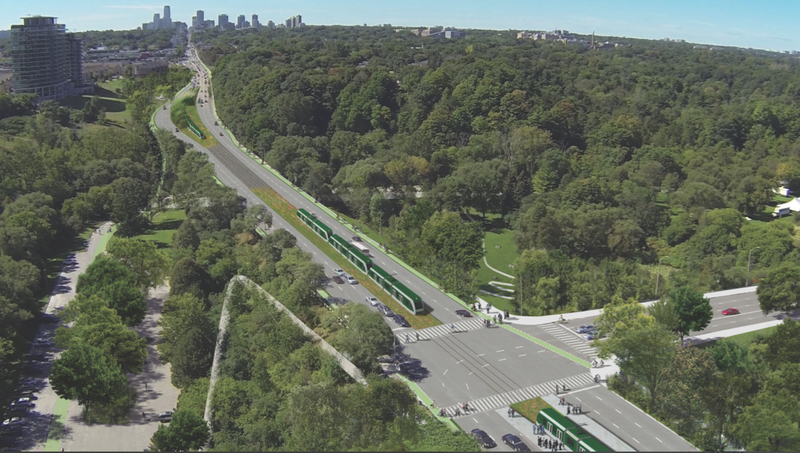 Rendering of a pedestrian and bike-friendly design for Eglinton near Laird, courtesy of the City of Toronto. In the day's closing panel, Monique Depral, executive director of the Eglinton Way Business Improvement Association shared her story: initially opposed to the proposed bike lanes on behalf of her members, this new information swayed the association to offer their support for bike infrastructure and for Depral to champion the cause. She now plans to meet with other BIAs throughout the city, spreading the bikes-are-good-for-business gospel. If businesses can embrace bikes then we may have a bike-friendly city in the making. Aerial image of a future Eglinton at Leslie courtesty of the City of Toronto. 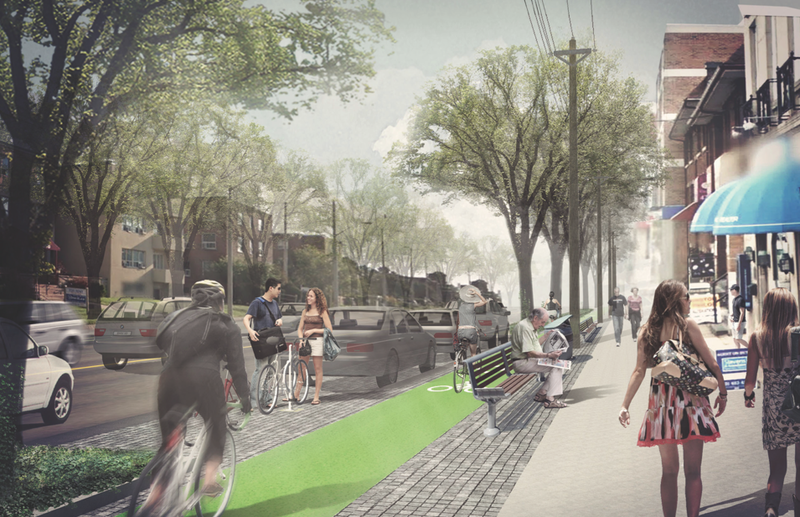 These images of Eglinton are featured in our current bike plan election issue.